I’m celebrating National Oatmeal Month by diving into a bowl of Purely Elizabeth Cinnamon Apple Pecan Oatmeal. With so many delicious flavors, it’s hard to believe that Purely Elizabeth Oatmeal is gluten free, free of added sugar and contains 6 grams of protein! It’s fun to make, beautiful to look at and even more enjoyable to eat! A baked Alaska is sweet and light with a mound of meringue that looks like a beautiful puffed cloud. This is a great day to whip up Jamie Oliver‘s unique twist on this classic dish: Baked Alaska Mince Pie! Happy National Cereal Day! I’m celebrating with a big ‘ol bowl of one of my all-time favorites – Barbara’s Bakery Multigrain Puffins! 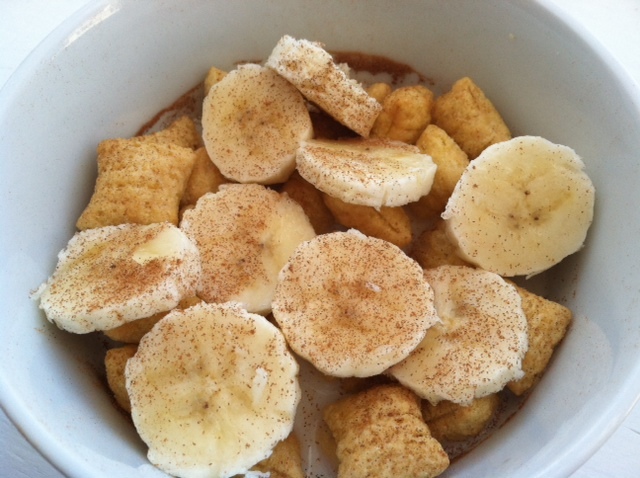 I like to top my cereal with fresh banana slices, ice-cold milk and a dash of cinnamon! What’s your favorite cereal topper?